To be honest I wasn't sure I was going to write a gift ideas post this year. However I happened to stumble on a few fun things that would be perfect for the locavore in your life. I'm a big fan of Winding Drive Jam out of Woodbury, CT. In their online shop they have a cute Holiday Gift Box featuring Holiday Jam, Sugar Plum Jam, Apple Pie Jam and Pear Eau de Vie Jam. They also have a Fruit Gift Box featuring Strawberry, Raspberry, Peach and Apple Pie jams. Each gift box is $23. Sure I love to cook, but sometimes it's nice to have a night off. And when I don't cook I like to support local restaurants who "get" my locavore philosophy. So, a super-easy sure-to-please gift idea is a gift certificate to a local restaurant, like Stanziato's Pizza in Danbury, CT, that supports local food and farmers. The Hudson Valley Seed Library is offering eight different gift baskets featuring seed packets in either a porcelain basket or fiber seed starting tray. The choices are: Culinary Herbs, Flowerworks, Garden Salad, Small Space Garden or a Make Your Own option. Each gift basket is $44, with the Make Your Own Basket starting at $8.75. Another fun gift idea for the budding or experienced gardener on your list is a gift membership to the Hudson Valley Seed Library. For only $8, a basic membership includes this year's Community Seed variety in a special Art Pack that comes wrapped in gift packaging as well as discounts on the 2013 seed catalog. If you would like your gift recipient to be able to select his or her own packs of seeds for the coming growing season you can also purchase a gift card along with the membership. 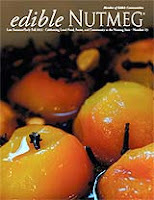 Edible Nutmeg is a community-based publication that promotes the local food, farms and cuisine of Connecticut. I read most things in digital form, but sometimes a beautiful print publication is a nice thing. This magazine is informative but it's also beautiful. A subscription to Edible Nutmeg can be a fun way to introduce someone to the local food scene. A year-long subscription goes for $28. Edible Communities Publications publishes an "edible" magazine in 65 communities throughout the country. If the locavores of your list don't live in CT, no problem, just visit the parent company website to find the one published nearest to them. I know I don't live in New York State, but I live just over the border so I think this next gift idea is still totally valid, and pretty darn cool. It's a 2013 New York State Seasonal Produce Calendar. Each month features a fruit or vegetable, a recipe and a list of all the other goodies in season that month for the New York state region. 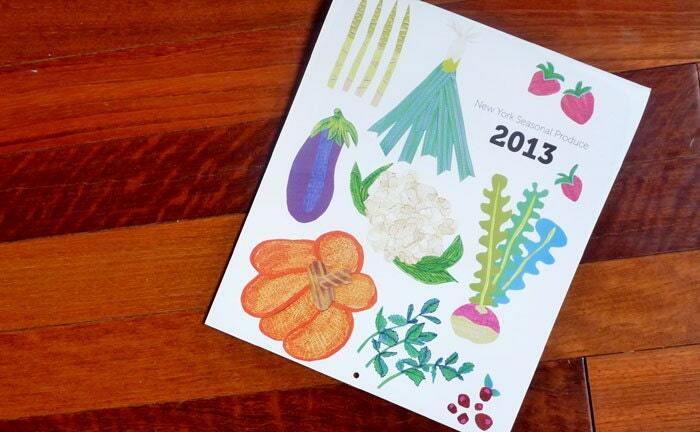 A sleek design calendar option is a 2013 Lunaradial Harvest Calendar. It displays lunar phase, zodiac, as well as fruits and vegetables currently in season for North America. Like I do every year: It's time for some shameless self-promotion. Help spread the Local Food Rocks love. Check out my web store with buttons, t-shirts, bags, magnets, stamps and more. And, right now receive 15% OFF all orders. Use Code: LASTCHANCE12. Well, that's all my local food gift ideas for this year. I'd love to know your delicious gift giving ideas. What are your finds this year?